Going against the recommendation from OOIDA , I decided to sign the lease and have now been on the road for three weeks as a Lease Operator. Even though I did not follow their recommendation, I did get a ton of information from them about the lease. They went over the Lease Agreement with me line by line and shared all of their concerns. It was very eye opening and I learned a lot. The biggest problem was that, although they promised a lot of things, it wasn't all in writing. And what was in writing was worded in a way so that they have all the power to control whatever they want. I may have made a mistake doing the lease, but at least I'm going into it with my eyes open, and I can really only blame myself if this goes south. Only time will tell. As a L/O your two biggest expenses are truck payment and fuel costs. You can sometimes negotiate the truck payment or pick a truck with a lower payment like I did, but once its set, its set. But you can always control your fuel costs. You have to find the best balance between speed and fuel mileage. Typically the slower you drive the better fuel mileage you get. Also proper shifting helps a lot. Ask your fuel dept at what RPMs you should shift for your particular truck. I have found I get reasonably good fuel mileage at 58 mph. Fuel mileage also varies depending on weather conditions and the terrain your driving over. You have to keep this in mind when accepting a load assignment. My first week out I did a short 400-mile run to get off the yard. Then a 2100-mile trip to California. I followed with a 2200-mile run to Missouri, then a pick up in Rogers, Arkansas where I was about 60 miles from the Joplin tornado. I had just driven through there the day before. We also had several tornado warnings through the night. Very scary stuff I tell ya. Then I was off back to California. Wind on that trip was terrible. There were 30 – 40 mph headwinds almost the whole way. Fuel about killed me on that trip. I hit my driver manager up on my way back to California and told him I needed him to do a better job. The trips have been good mileage so far, but too much sittin' around waiting to get loaded. So after getting unloaded, I get a load assignment that's 340 miles. I about die. I call my DM to see what's up and he laughs and says to take the load and he will take care of me with the next one. OK, so I run this load up to Tracy, CA and then get a sweet 3300 mile run with four pickups, a produce load to Miami, FL. I was happy as a clam. I run the heck outta this load but run out of hours (70 hr clock) in Houston and don't have the hours to finish the run. Still, it was great miles in a short period of time. So I swap that load for a load headed close to home, but I have a small wreck in the parking lot before leaving. My stupidity, really. I let my foot off the brake while looking at a parking spot and rolled into the truck in front of me. I have a $500 deductible so this will cost me later. So I'm sitting in Maxton, NC waiting to unload so I can take a couple relaxing days at home. OOIDA is an international trade association representing the interests of independent owner-operators and professional drivers on all issues that affect truckers. The over 150,000 members of OOIDA are men and women in all 50 states and Canada who collectively own and/or operate more than 240,000 individual heavy-duty trucks and small truck fleets. The mission of OOIDA is to serve owner-operators, small fleets and professional truckers; to work for a business climate where truckers are treated equally and fairly; to promote highway safety and responsibility among all highway users; and to promote a better business climate and efficiency for all truck operators. 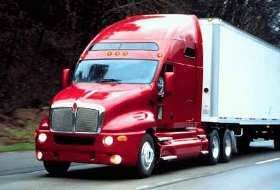 To lease a truck, become an owner operator, or be a company driver is a question I've pondered, and I've decided to lease. Here's my story. After a major mistake on my part, I found out how far a great attitude and hard work can take you, and how great a 'starter company' can treat you after all. Home time is precious to an over the road driver and their family, and it's painful when it gets cut short by an unexpected call from the company. After just a short time on the road with my husband I've come to realize that everyday life in the trucking industry is like a roller coaster ride.